Building façade systems, or building cladding, may require independent testing for weather performance, air permeability or fire safety. QED Environmental Services provides testing services for facades on new or existing buildings, whether the façade is fitted from inception or retrofitted. Building facades constructed from aluminium composite panels (ACPs) may present a risk in the case of fire. The ACPs on many existing buildings are unlikely to be judged non-combustible under Australian Standard 1530.1. However, this is not to say buildings are not compliant with Building Code of Australia (BCA) as this will depend on certification of the ACP material, or the degree of fire retardant in the ACP core and other fire engineering factors in the building’s design and operation. 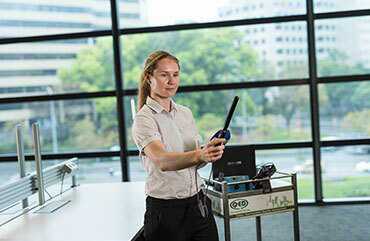 QED works with qualified fire safety engineers on a three-stage solution for building owners, to assist them to manage risk and assure compliance with Australian Building Codes. The first stage is reviewing available building documentation to determine compliance with BCA. There are several alternative documentary compliance mechanisms which may apply on a case by case basis. If insufficient documentation is available to assure compliance, we proceed to the second stage. Stage two involves testing a small sample of ACP from the subject building to determine the composition of its core material and an indication of its fire-retardant potential through various analyses including destructive testing. Note this is not testing to AS 15301.1 itself. The final stage is procurement of a fire safety engineer’s opinion on the suitability or otherwise of the ACPs based on requirements outlined in the Building Code of Australia (BCA) and any remedial action required which in our experience rarely comprises complete removal of the façade but may entail alternative fire safety or engineered solutions. Our customers have taken the initiative to assure themselves of ACP façade compliance across their portfolios, undertaking best practice risk management, assisting with tenant engagement and expediting insurance renewals. Watch the video below for more information on how we undertake building cladding testing. To book your consultation please contact us.